Introduction: The boreal forest or taiga exists as a nearly continuous belt of coniferous trees across North America and Eurasia. Overlying formerly glaciated areas and areas of patchy permafrost on both continents, the forest is mosaic of successional and subclimax plant communities sensitive to varying environmental conditions. Taiga is the Russian name for this forest which covers so much of that country. However, the term is used in North America as well. Climate: The taiga corresponds with regions of subarctic and cold continental climate (Koeppen’s Dfb, Dfc, and Dwd climate types). 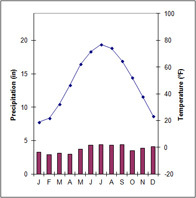 Long, severe winters (up to six months with mean temperatures below freezing) and short summers (50 to 100 frost-free days) are characteristic, as is a wide range of temperatures between the lows of winter and highs of summer. 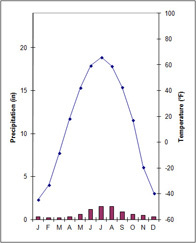 For example, Verkhoyansk, Russia, has recorded extremes of minus 90° F and plus 90 ° F. Mean annual precipitation is 15 to 20 inches, but low evaporation rates make this a humid climate. Vegetation: Needleleaf, coniferous (gymnosperm) trees are the dominant plants of the taiga biome. A very few species in four main genera are found: the evergreen spruce (Picea), fir (Abies), and pine (Pinus), and the deciduous larch or tamarack (Larix). In North America, one or two species of fir and one or two species of spruce are dominant. Across Scandanavia and western Russia the Scots pine is a common component of the taiga. Conical shape – promotes shedding of snow and prevents loss of branches. 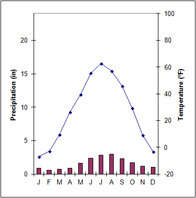 Needleleaf – narrowness reduces surface area through which water may be lost (transpired), especially during winter when the frozen ground prevents plants from replenishing their water supply. The needles of boreal conifers also have thick waxy coatings–a waterproof cuticle–in which stomata are sunken and protected from drying winds. Dark color – the dark green of spruce and fir needles helps the foliage absorb maximum heat from the sun and begin photosynthesis as early as possible. Soil: Podzolization occurs as a result of the acid soil solution produced under needleleaf trees. 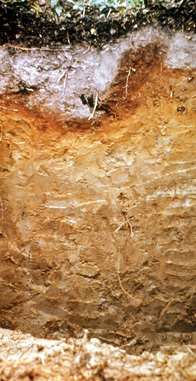 The main soil order associated with the taiga is spodosol. Bogs (muskeg) occur in poorly drained, glacial depressions. Sphagnum moss forms a spongy mat over ponded water. Growing on this mat are species of the tundra such as cottongrass and shrubs of the heath family. Black spruce and larch ring the edge. Larch forests claim the thin, waterlogged substrate in level areas underlain with permafrost. These forests are open with understories of shrubs, mosses and lichens. In Alaska stands of Larix larichina are localized phenomena, but in Siberia east of the Yenesei River the extreme continentality and nearly continuous permafrost give rise to vast areas dominated by Larix dihurica. Fauna: Fur-bearing predators like the lynx (Felis lynx) and various members of the weasel family (e.g., wolverine, fisher, pine martin, mink, ermine, and sable) are perhaps most characteristic of the boreal forest proper. The mammalian herbivores on which they feed include the snowshoe or varying hare, red squirrel, lemmings, and voles. Large herbivores are more closely associated with successional stages where there is more nutritious browse available and include elk or wapiti (Cervus elaphus, known as red deer in Europe) and moose (Alces alces, known as elk in Europe). The beaver (Castor canadensis), on which the early North American fur trade was based, is also a creature of early successional communities, indeed its dams along streams create such habitats. Among birds, insect-eaters like the wood warblers are migratory and leave after the breeding season. Seed-eaters (e.g., finches and sparrows) and omnivores (e.g., ravens) tend to be year-round residents. During poor cone years, normal residents like the evening grosbeak, pine siskin, and red crossbill leave the taiga in winter and may be seen at bird feeders here in Virginia. Distribution patterns within the boreal forest biome: The boreal forest is restricted to the northern hemisphere. It is circumpolar in distribution, as are many of the species which comprise it and even more of the genera. In general, plants have different species represented on North America and Eurasia; the mammals of both continents tend to be conspecific. A mixed needleleaf evergreen-broadleaf deciduous forest, the ecotone with the Temperate Broadleaf Deciduous Forest. In the US, this southern ecotone is dominated by white pine (Pinus strobus), sugar maple (Acer saccharum), and American beech (Fagus americanus). In the Pacific Northwest, what amounts to a temperate rainforest is dominated by needleleaf species such as Douglas fir, western hemlock, and other giants. This forest type is the center of a major controversy regarding timber operations in old growth forests. On the windward (western) slopes of the Sierra Nevada at elevations between 4,000 and 8,000 feet, the tall western conifers are joined by the magnificent giant sequoia (Sequoia gigantea). The specimen named General Sherman is some 3,800 years old, 272 feet tall, and has a diameter of 37 feet. The congener of this sequoia, the redwood (S. sempervirens) grows along the northern California coast. Their closest relative is the Dawn Redwood, a deciduous conifer of the genus Metasequoia from China. In the Rocky Mountains, where fire is an important part of the environment, lodgepole pines (Pinus contorta) form nearly pure, single-aged stands. The great fire of Yellowstone National Park demonstrated once again the association of this species and its ecosystem with repeated burns. Note: This page has been translated into Georgian by Ana Mirilashvili at http://lpacode.com/boreal-forest-taiga/ and into Croation by Milica Novak at http://pro4education.com/boreal-forest-taiga/. Marek Murawski has translated it into Polish at http://fsu-university.com/boreal-forest-taiga/. A Spanish version by Laura Mancini can be found at http://expereb.com/boreal-forest-taiga/. This page has been translated into Russian by FlyClipart at https://flyclipart.com/ru-boreal-forest and by Michael Taylor at https://veepn.com/translation/boreal-forest/.